Bouteloua gracilis (blue grama) is a long-lived, warm-season, perennial grass, native to North America. It is a green or greyish, low-growing, drought-tolerant grass with limited maintenance. Blue grama grows on a wide array of topographic positions, and in a range of well-drained soil types, from fine to coarse textured. Plant height at maturity ranges from 6"–12". The roots generally extend 12"–18" from the edge of the plant, and 3'–6' deep. Established plants are grazing-, cold-, and drought-tolerant, though prolonged drought leads to a reduction in root number and extent. They employ an opportunistic water-use strategy, rapidly using water when available, and becoming dormant during less-favorable conditions. Grown by the horticulture industry, and used in perennial gardens; naturalistic and native plant landscaping; habitat restoration projects; and in residential, civic, and highway erosion control. Blue Grama flowers are also used in dried flower arrangements. 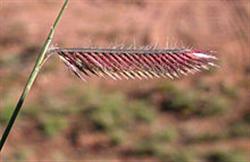 Among the Zuni people, the grass bunches are tied together and the severed end used as a hairbrush, the other as a broom. Bunches are also used to strain goat's milk.